Human high molecular weight-melanoma associated Ag (HMW-MAA) mimics have been shown to elicit HMW-MAA-specific humoral immune responses that appear to be clinically beneficial. This finding has stimulated interest in characterizing the mechanism(s) underlying the ability of the elicited Abs to exert an anti-tumor effect. To address this question, in the present study, we have generated HMW-MAA-specific Abs by sequentially immunizing rabbits with the peptide P763.74, which mimics the HMW-MAA determinant recognized by mAb 763.74, and with HMW-MAA+ melanoma cells. HMW-MAA-specific Abs isolated from immunized rabbits mediated cell-dependent cytotoxicity but did not mediate complement-dependent cytotoxicity of HMW-MAA+ melanoma cells. These Abs also effectively inhibited spreading, migration and Matrigel invasion of HMW-MAA+ melanoma cells. Besides contributing to our understanding of the role of HMW-MAA in the biology of melanoma cells, these results suggest that both immunological and nonimmunological mechanisms underlie the beneficial clinical effects associated with the induction of HMW-MAA-specific Abs in melanoma patients immunized with a HMW-MAA mimic. Human high molecular weight-melanoma associated Ag (HMW-MAA)3 is a membrane-bound chondroitin sulfate proteoglycan that is highly expressed by melanoma cells. This Ag belongs to a family of adhesion receptors that mediate both cell–cell and cell–extracellular matrix (ECM) interactions (1). Recent findings have demonstrated that HMW-MAA and its rat ortholog, NG2, are involved in the activation of several signaling pathways modulating melanoma cell adhesion, spreading, migration, and invasion. HMW-MAA enhances the adhesion of melanoma cells to capillary endothelium and spreading on ECM components, including laminin, tenascin, and types II, V, and VI collagen (2, 3, 4, 5). The interactions of NG2 with ECM components trigger cytoskeletal rearrangements that lead to cell spreading and migration (6, 7). All of these functions have been proposed to contribute to the ability of HMW-MAA and NG2 to augment the metastatic potential of malignant cells that express these Ags (7). We have demonstrated in a phase I/II clinical trial that administration of anti-Id mAb MK2-23, which mimics the HMW-MAA determinant defined by mAb 763.74, induced a HMW-MAA-specific Ab response that was associated with a statistically significant survival prolongation of patients with melanoma (8). This observation suggested that HMW-MAA-specific Abs are likely to exert an inhibitory effect on HMW-MAA+ melanoma cells, leading to an improvement in the clinical course of the disease. Consistent with this possibility, HMW-MAA-specific mAbs have been shown to inhibit the growth of human melanoma cells implanted in SCID mice (9). However, the mechanism(s) underlying these observations have not been well defined. In a previous study, we have demonstrated that P763.74, which also mimics the HMW-MAA determinant recognized by mAb 763.74, elicited HMW-MAA-specific immune responses in mice (10). However, the ability of the elicited Abs to inhibit HMW-MAA-mediated functions could not be investigated in that study because of the practical difficulties in obtaining sufficient amounts of Abs from the immunized mice. Therefore, in the present study, we have chosen to use rabbits for the following reasons: 1) a greater quantity of serum can be obtained for functional assays; 2) rabbits express a homologue of HMW-MAA with an antigenic profile and tissue distribution similar to those in humans (11); and 3) rabbits represent an outbred host population. We have immunized rabbits sequentially with peptide P763.74 and with HMW-MAA+ Colo38 cells, because this prime-boost strategy has been demonstrated previously to markedly enhance the HMW-MAA-specific Ab response in mice (10). We have tested whether HMW-MAA-specific Abs exert an effect on HMW-MAA+ melanoma cells via 1) immunological mechanisms, such as Ab-dependent cell-mediated cytotoxicity (ADCC) or complement-dependent cytotoxicity (CDC) and/or 2) nonimmunological mechanisms, such as inhibition of one or more HMW-MAA-mediated cellular functions. Cultured HMW-MAA+ Colo38 and MV3 human melanoma cells, HMW-MAA− M14 clone 5 (M14#5) human melanoma cells (provided by Dr. J. B. McCarthy, University of Minnesota, Minneapolis, MN), and HMW-MAA− LG2 human B-lymphoid cells were maintained at 37°C in a 5% CO2 atmosphere in RPMI 1640 medium (Tissue Culture Media Facility, Roswell Park Cancer Institute, Buffalo, NY) supplemented with 10% FCS (BioWhittaker). The M14#5/HMW-MAA cells, which express HMW-MAA following transfection of M14#5 cells with a pcDNA3.1+ plasmid containing the HMW-MAA cDNA, were maintained as described above with the additional supplementation of 0.4 mg/ml G418 (Promega). Human PBMC were isolated from heparinized blood of a healthy donor by differential centrifugation on a Ficoll-Paque (Amersham Biosciences) density gradient, according to the manufacturer’s instructions. HMW-MAA-specific mAb 763.74, 100-kDa MAA-specific mAb 376.96, HLA class I Ag-specific mAb TP25.99, GD3 ganglioside-specific mAb R24, anti-Id mAb MK2-23 (which mimics the determinant recognized by mAb 763.74), and anti-Id mAb T8-203 (which mimics the determinant recognized by HLA-A2, A24, A28-specific mAb CR11-351) were developed and characterized as described previously (12, 13, 14, 15, 16). mAbs were purified from ascitic fluid by sequential ammonium sulfate and caprylic acid precipitation (17). HRP-conjugated goat anti-rabbit IgG Abs were purchased from Jackson ImmunoResearch Laboratories. FITC-labeled F(ab′)2 of goat anti-rabbit IgG Abs were purchased from BD Pharmingen. Human serum was obtained from whole blood of a healthy donor and used as the source of human complement. HMW-MAA peptide mimic P763.74 (QCTGPNVATNCR; isolated as described previously; Ref. 10) and control peptide Delta225–239 (GDQIPKFAVATLPPA; derived from the human proteasome subunit Delta) were synthesized by the Molecular Genetics Instrumentation Facility (University of Georgia, Athens, GA). Peptides used for immunization were conjugated to keyhole limpet hemocyanin (KLH) (Pierce) as described previously (10). Five-month-old female New Zealand white rabbits were purchased from Covance Research Products and maintained under specific pathogen-free conditions in the animal core facility at Roswell Park Cancer Institute. Experiments were conducted under an animal protocol approved by the Institutional Animal Care and Use Committee at the Roswell Park Cancer Institute. Rabbits (two per group) were immunized intradermally (i.d.) at 3-wk intervals with KLH-conjugated peptides. Five hundred μg of each conjugated peptide was mixed 1/1 (v/v) with CFA for priming and with IFA for subsequent injections. Rabbits were boosted with an i.d. injection of HMW-MAA+ Colo38 cells or HMW-MAA− LG2 cells (5 × 106 cells/rabbit) on day 132. Rabbits were bled on day 0, and 1 wk following each immunization. Total IgG were isolated from rabbit sera using HiTrap Protein A HP columns (Amersham Biosciences), according to the manufacturer’s instructions. The purity of the IgG was determined by SDS-PAGE and Coomassie brilliant blue staining. The binding assays to assess the reactivity of sera with peptides and cells were performed as described previously (16, 18). The Ab titer was defined as the highest serum dilution which resulted in 50% of maximal binding of serum to peptides or cells. The inhibition assay to determine the ability of sera to inhibit binding of mAb to HMW-MAA was performed by incubating diluted sera (range 1/10 to 1/160) with HMW-MAA+ melanoma cells (1 × 105/well) at 4°C for 2 h. Cells were then washed and incubated with biotinylated HMW-MAA-specific mAb 763.74 at 4°C for an additional 1 h. Bound Abs were detected by incubation with HRP-streptavidin (HRP-SA; Fisher Scientific). The inhibition assay to determine the expression of the Id recognized by mAb MK2-23 in the Ag combining site of HMW-MAA-specific rabbit Abs was performed by incubating purified rabbit IgG (6 μg/ml) with mAb MK2-23 (0.08–5 μM) at 4°C for 1 h. The mixture was then transferred to wells containing HMW-MAA+ melanoma cells (1 × 105/well), and incubation was continued at 4°C for an additional 1 h. Cells were then washed with 0.5% BSA in PBS, and bound Abs were detected by incubation with HRP-conjugated goat anti-rabbit Ig Abs at 4°C for 1 h.
The results of the inhibition assays are expressed as percent inhibition of the binding of a selected Ab to the target Ag. It was calculated using the formula: % inhibition = (OD450 in the absence of inhibitor − OD450 in the presence of inhibitor)/OD450 in the absence of inhibitor) × 100. Flow cytometry analysis of cells stained with Abs was performed as described (19). Briefly, 5 × 105 cells were incubated for 1 h on ice with purified rabbit IgG (2 μg/100 μl in 1% BSA in PBS). Cells were then washed twice with 0.5% BSA in PBS and incubated for an additional 30 min on ice with FITC-labeled F(ab′)2 of goat anti-rabbit IgG Abs. Following two washes, cells were fixed in 2% paraformaldehyde (Sigma-Aldrich) and analyzed with a FACScan flow cytometer (BD Biosciences) using Cell Quest software (BD Biosciences). Cells labeled with 125I (Na125I; Amersham Biosciences) by the lactoperoxidase method (20) were solubilized in Triton X-100-containing lysis buffer (50 mM Tris-HCl, 1 mM EDTA, 150 mM NaCl, 0.5% Triton X-100, 1 mM PMSF, 1 μg/ml leupeptin, 1 μg/ml pepstatin, and 1 μg/ml aprotinin (pH 7.4)). Indirect immunoprecipitation, SDS-PAGE, and autoradiography were performed following the methodology described previously (21). The ADCC and CDC assays were performed as described (22, 23) with minor modifications. Briefly, target cells were labeled for 1 h at 37°C with Na2[51Cr]O4, plated in 96-well plates (Costar) at 1 × 104 cells/well, and incubated with 3 μg/well purified rabbit IgG or mAb 763.74 for 30 min at room temperature. Cells were then washed with serum-free RPMI 1640 medium and incubated for 4 h at 37°C with human PBMC for ADCC or human serum for CDC. Supernatants were harvested, and the radioactivity was counted in a gamma counter (Packard Cobra II Auto γ Model 5002; PerkinElmer). Both assays were performed in triplicates, and the percentage of specific cytotoxicity was calculated using the formula: percentage of cytotoxicity = (experimental cpm − spontaneous cpm)/(maximum cpm − spontaneous cpm) × 100. The spontaneous 51Cr release was <25% of maximum 51Cr release. HMW-MAA+ MV3 melanoma cells were cultured in serum-free RPMI 1640 medium overnight. On the second day, cells were incubated for 1 h at 37°C with purified rabbit IgG (20 μg/ml in RPMI 1640 medium with 1% BSA) and seeded on cover slips that were coated with 2 μg/cm2 type I collagen. After a 1-h incubation at 37°C, cells were fixed with 2% paraformaldehyde (Sigma-Aldrich) and stained with rhodamine-phalloidin (Molecular Probes). The extent of cell spreading was assessed by using a fluorescence microscope (KS300; Zeiss). The cell migration and invasion assays were performed in 24-well Transwell plates (Costar 3422; Corning) as described (24, 25), with the following modifications: For the migration assay, the bottom surfaces of the Transwell membranes were precoated overnight at 4°C with fibronectin (20 μg/ml in serum-free RPMI 1640 medium). For the Matrigel invasion assay, the upper chambers of the Transwell plates were precoated for 4 h at 37°C with Matrigel (1 mg/ml in serum-free RPMI 1640 medium). HMW-MAA+ MV3 melanoma cells were cultured in serum-free RPMI 1640 medium overnight. On the second day, cells were incubated for 40 min at 37°C with purified rabbit IgG (20 μg/ml in RPMI 1640 medium containing 1% BSA). Treated MV3 cells were seeded in the upper chambers of 24-well Transwell plates. The lower chambers of the Transwell were filled with 600 μl of culture medium (RPMI 1640 medium supplemented with 10% FCS) containing 5 μg/ml fibronectin as an adhesive substrate. Following incubation for 8 h (migration assay) or 20 h (Matrigel invasion assay) at 37°C, the Transwells were stained with the HEMA 3 stain set solution (Fisher Scientific). Cells on the top of the Transwells were scraped off with a cotton swab, and the remaining cells were enumerated under a light microscope (TE300; MVI) by two investigators in a blinded fashion, based on four randomly chosen high-power fields. The statistical significance of differences among the results obtained was analyzed using the two-tailed, unpaired Student t test. A difference was considered statistically significant when the p value was <0.05. Rabbits were immunized with peptide P763.74 on days 0, 21, 42, 63, 84, and 105. Sera were harvested 7 days after each immunization and tested in binding assays for the induction of Abs reacting with the immunizing peptide and with HMW-MAA+ Colo38 melanoma cells. The P763.74-specific Ab response was detected in sera harvested as early as day 28 (post second immunization; titer >1000), and the peptide-specific Ab titer increased following each subsequent immunization with peptide P763.74 (Fig. 1⇓A). In contrast, no reactivity of the immune sera with HMW-MAA+ melanoma cells was detected, even when the sera were harvested 1 wk following the sixth immunization (Fig. 2⇓). Boosting with Colo38 cells on day 133 significantly (p < 0.05) increased the level of Abs reacting with HMW-MAA+ melanoma cells. In contrast, sera from rabbits immunized with control peptide Delta225–239 and boosted with Colo38 cells did not react with HMW-MAA+ melanoma cells (Fig. 2⇓), even though the same sera reacted with the immunizing peptide Delta225–239 (Fig. 1⇓B). Induction of Abs with selective reactivity to peptide P763.74 or control peptide Delta225–239 in rabbits immunized with peptide P763.74 or peptide Delta225–239. Rabbits were immunized with peptide P763.74 or control peptide Delta225–239 (500 μg of each peptide/injection/rabbit) on days 0, 21, 42, 63, 84, and 105, and were both boosted with HMW-MAA+ Colo38 melanoma cells (5 × 106 cells/injection/rabbit) on day 132. Sera were harvested on day 0 and 7 days after each immunization. A, Two-fold dilutions of sera from P763.74-immunized rabbits were incubated for 2 h at room temperature with plate-bound peptide P763.74 (▪) or irrelevant peptide (▦). B, Two-fold dilutions of sera from Delta225–239-immunized rabbits were incubated for 2 h at room temperature with plate-bound peptide Delta225–239 (□) or irrelevant peptide (▦). Bound Abs were detected with HRP-conjugated goat anti-rabbit IgG Abs; the reaction was developed using tetramethylbenzidine (TMB) substrate. OD was measured at 450 nm. Results are expressed as mean ± SD of the highest dilution of sera from two rabbits giving 50% of the maximal binding to peptides. Induction of Abs with selective reactivity to HMW-MAA+ melanoma cells in rabbits sequentially immunized with peptide P763.74 and HMW-MAA+ melanoma cells. Rabbits were immunized with peptide P763.74 or control peptide Delta225–239 (500 μg of each peptide/injection/rabbit) on days 0, 21, 42, 63, 84, and 105, and were both boosted with HMW-MAA+ Colo38 melanoma cells (5 × 106 cells/injection/rabbit) on day 132. Sera were harvested on day 0, and 7 days after each immunization. Two-fold dilutions of sera from rabbits immunized with P763.74 (▪) or Delta225–239 (□) were incubated for 2 h at 4°C with Colo38 cells (1 × 105/well). Bound Abs were detected with HRP-conjugated goat anti-rabbit IgG Abs; the reaction was developed using TMB substrate. OD was measured at 450 nm. Results are expressed as mean ± SD of the highest dilution of sera from two rabbits, giving 50% of the maximal binding to Colo38 cells. ∗, p < 0.05. 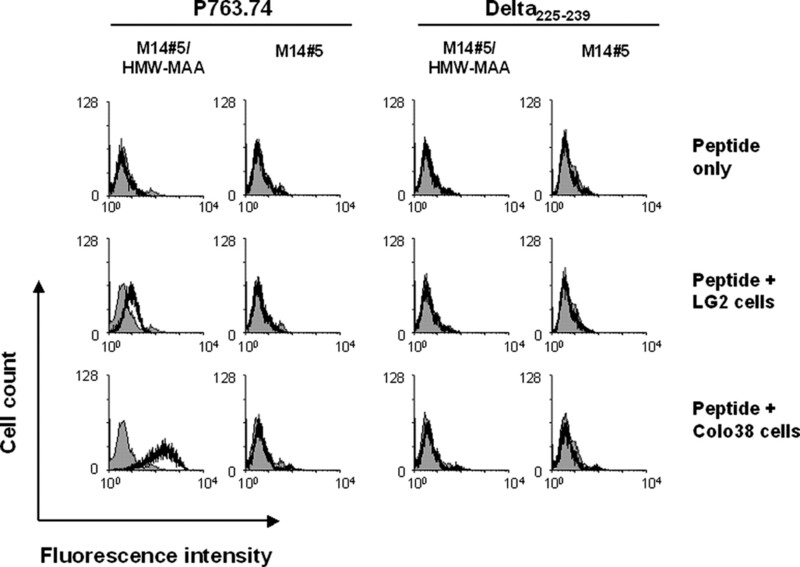 Flow cytometry analysis demonstrated that IgG isolated from rabbits sequentially immunized with peptide P763.74 and Colo38 cells strongly stained M14#5/HMW-MAA cells (Fig. 3⇓). Two lines of evidence indicate that the staining is mediated by HMW-MAA-specific Abs. First, the same IgG preparation isolated from immunized rabbits did not stain the parental HMW-MAA− M14#5 cells (Fig. 3⇓). Second, no staining was detected when M14#5/HMW-MAA cells were incubated with IgG isolated from rabbits immunized with peptide P763.74 only, with peptide P763.74 and HMW-MAA− LG2 lymphoid cells, or with control peptide Delta225–239 and Colo38 cells (Fig. 3⇓). The HMW-MAA-specificity of the Abs elicited in rabbits by sequential immunizations with peptide P763.74 and Colo38 cells was corroborated by the ability of their sera to immunoprecipitate the two characteristic components of HMW-MAA from a radiolabeled Colo38 cell lysate (Fig. 4⇓A). In contrast, the HMW-MAA components were not immunoprecipitated from a radiolabeled Colo38 cell lysate by sera from rabbits sequentially immunized with peptide P763.74 and HMW-MAA− LG2 lymphoid cells or with control peptide Delta225–239 and Colo38 cells (Fig. 4⇓A and data not shown). Sequential immunodepletion experiments provided conclusive evidence that the rabbit immune sera immunoprecipitated HMW-MAA, because they immunoprecipitated no components from a radiolabeled Colo38 cell lysate that had been immunodepleted with HMW-MAA-specific mAb 763.74 (Fig. 4⇓B). Conversely, mAb 763.74 immunoprecipitated no components from a radiolabeled Colo38 cell lysate that had been immunodepleted with rabbit immune sera. The immunodepletion with either immune sera or mAb 763.74 is specific to HMW-MAA, because the 100-kDa MAA-specific mAb 376.96 immunoprecipitated the corresponding Ag from a radiolabeled Colo38 cell lysate that had been immunodepleted with either rabbit immune sera or mAb 763.74. Flow cytometry analysis of HMW-MAA+ melanoma cells stained with IgG isolated from rabbits sequentially immunized with peptide P763.74 and HMW-MAA+ melanoma cells. HMW-MAA+ M14#5/HMW-MAA transfectants and parental HMW-MAA− M14#5 cells were incubated on ice with IgG (2 μg) isolated from rabbits that were immunized with peptide P763.74 or control peptide Delta225–239 only, or with peptide P763.74 or Delta225–239, followed by LG2 or Colo38 cells. Following washing, cells were incubated on ice with FITC-labeled F(ab′)2 of goat anti-rabbit IgG Abs. Cells were then washed, fixed in 2% paraformaldehyde, and analyzed with a FACScan flow cytometer. Results are expressed as fluorescence intensity (empty histogram). IgG isolated from rabbit preimmune sera were used as controls (gray histogram). SDS-PAGE analysis of Ags immunoprecipitated (IP) from a HMW-MAA+ melanoma cell lysate by sera of rabbits sequentially immunized with peptide P763.74 and HMW-MAA+ melanoma cells. A, 125I-labeled HMW-MAA+ Colo38 or HMW-MAA− LG2 cells were solubilized with 0.5% Triton X-100-containing lysis buffer. Ags were immunoprecipitated from the radiolabeled cell lysates with serum from a rabbit sequentially immunized with peptide P763.74 and Colo38 cells or with control peptide Delta225–239 and Colo38 cells. HMW-MAA-specific mAb 763.74 and rabbit preimmune sera were used as controls. Ags were eluted from the immunoadsorbent, separated by 8% SDS-PAGE, and processed for autoradiography using Hyperfilm (AmershamBiosciences). B, The 125I-labeled Colo38 cells were solubilized with 0.5% Triton X-100-containing lysis buffer. 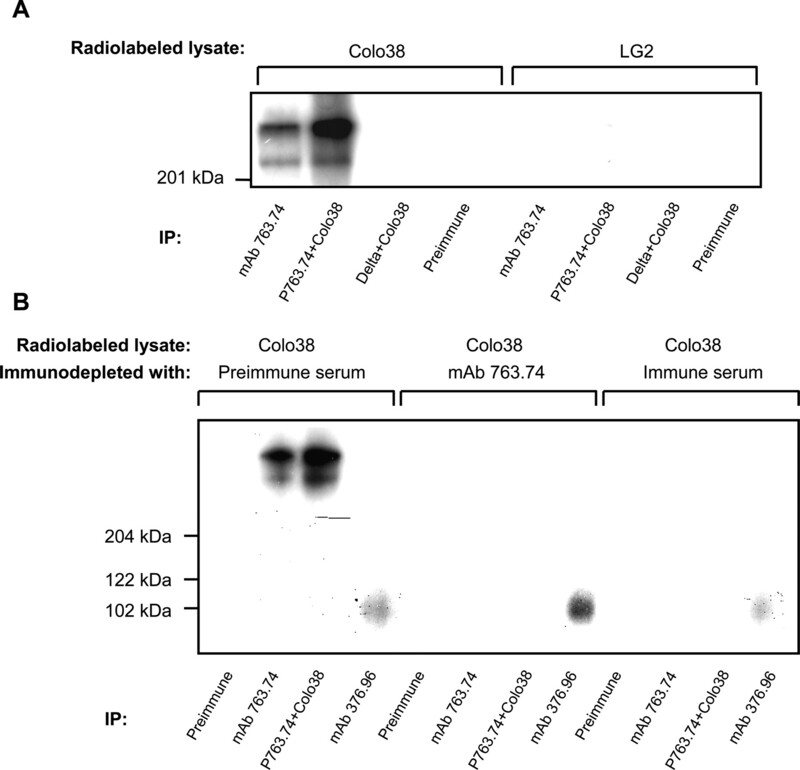 Aliquots of radiolabeled cell lysates were immunodepleted with serum from a rabbit sequentially immunized with peptide P763.74 and Colo38 cells (Immune serum), or with HMW-MAA-specific mAb 763.74. Immunodepletion with rabbit preimmune sera was used as a control. Each immunodepleted cell lysate was then immunoprecipitated with serum from a rabbit sequentially immunized with peptide P763.74 and Colo38 cells or with HMW-MAA-specific mAb 763.74. Immunoprecipitation with 100-kDa MAA-specific mAb 376.96 or with rabbit preimmune sera were used as controls. Ags were eluted from the immunoadsorbent, separated by 8% SDS-PAGE, and processed for autoradiography using Hyperfilm. The HMW-MAA specificity of the rabbit Ab response was further corroborated by its ability to inhibit the binding of HMW-MAA-specific mAb 763.74 to Colo38 cells in a dose-dependent manner (p < 0.05 at serum dilutions 1/10 and 1/80; Fig. 5⇓A). The binding inhibition is specific, because the rabbit immune sera did not significantly inhibit the binding of HLA class I Ag-specific mAb TP25.99 to Colo38 cells (p > 0.05 at all serum dilutions; Fig. 5⇓B). 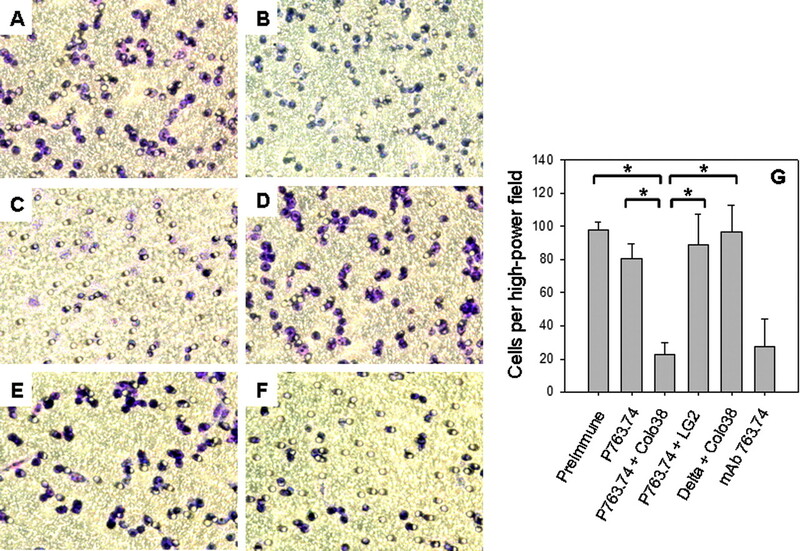 Sera harvested from rabbits sequentially immunized with control peptide Delta225–239 and Colo38 cells inhibited neither the binding of mAb 763.74 nor that of mAb TP25.99 to Colo38 cells (Fig. 5⇓, A–B). Importantly, HMW-MAA-specific rabbit Abs express the Id defined by anti-Id mAb MK2-23, because their binding to HMW-MAA+ cells was inhibited by anti-Id mAb MK2-23 in a dose-dependent fashion (Fig. 5⇓C). The inhibition is specific, because control anti-Id mAb did not markedly inhibit the binding of rabbit Abs to HMW-MAA+ cells. Characterization of fine specificity of Abs elicited in rabbits sequentially immunized with peptide P763.74 and HMW-MAA+ melanoma cells. Sera harvested from rabbits sequentially immunized with either peptide P763.74 (▪) or Delta225–239 (□), followed by HMW-MAA+ Colo38 cells were incubated with M14#5/HMW-MAA cells (2 × 105/well) for 2 h at 4°C. Cells were washed and then incubated for an additional 1 h at 4°C with biotinylated mAb 763.74 (A) or control mAb TP25.99 (B). Bound biotinylated mAbs were detected with HRP-streptavidin, and the reaction was developed using TMB substrate. Results are expressed as percentage inhibition of the binding of biotinylated mAb to M14#5/HMW-MAA cells in the presence of immune serum, compared with the binding of the same mAb in the presence of rabbit preimmune sera. ∗, p < 0.05. C, IgG isolated from rabbits immunized sequentially with peptide P763.74 and Colo38 cells were preincubated with mAb MK2–23 (•) or mAb T8–203 (○) for 1 h at 4°C. The solution was then transferred to wells containing M14#5/HMW-MAA cells, which were incubated for an additional 1 h at 4°C. Cells were then washed with 1% BSA-PBS, and bound Abs were detected by incubation with HRP-conjugated goat-anti-rabbit Abs for 1 h at 4°C. 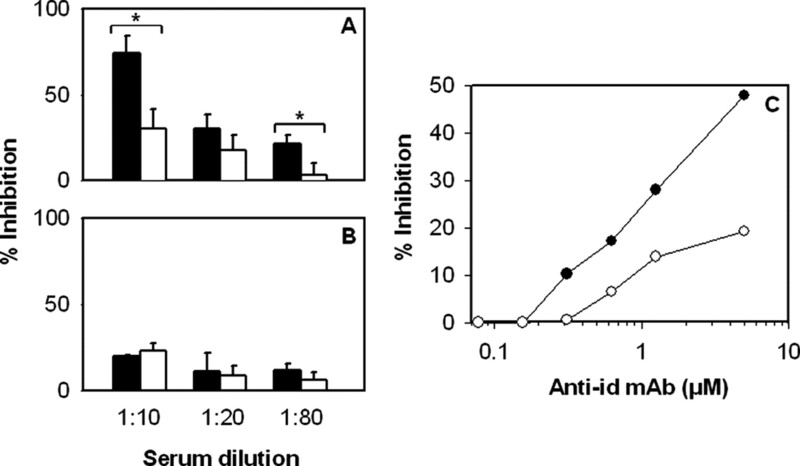 Results are expressed as percentage inhibition of the binding of rabbit sera to cells in the presence of mAb, compared with the binding of rabbit sera in the absence of mAb. To determine whether IgG isolated from rabbits sequentially immunized with peptide P763.74 and Colo38 cells mediate cell-dependent lysis of HMW-MAA+ melanoma cells, M14#5/HMW-MAA cells were incubated with purified rabbit IgG and human PBMC isolated from a healthy donor. The extent of lysis was ∼37 and 20% at E:T ratios of 100:1 and 4:1, respectively (Fig. 6⇓A). The level of lysis mediated by purified rabbit IgG is significantly higher than that mediated by IgG isolated from rabbit preimmune sera and from rabbits sequentially immunized with peptide P763.74 and LG2 cells or with control peptide Delta225–239 and Colo38 cells (p < 0.05 for all comparisons). Interestingly, the level of lysis mediated by purified rabbit IgG also is significantly higher than that mediated by mAb 763.74 (p < 0.05). The cell lysis is HMW-MAA specific, because no lysis was detected when the parental HMW-MAA− M14#5 cells were used as target cells in ADCC assays performed with purified rabbit IgG (Fig. 6⇓B). Differential ability of IgG from rabbits sequentially immunized with peptide P763.74 and HMW-MAA+ melanoma cells to mediate cell-dependent and complement-dependent cytotoxicity of HMW-MAA+ melanoma cells. The 51Cr-labeled HMW-MAA+ M14#5/HMW-MAA (A and C) or HMW-MAA− parental M14#5 (B and D) melanoma cells were seeded in 96-well plates at 1 × 104 cells/well. Cells were incubated for 30 min at room temperature with IgG (3 μg/well) isolated from rabbits sequentially immunized with peptide P763.74 and Colo38 cells (▪), with peptide P763.74 and LG2 cells (□), with peptide Delta225–239 and Colo38 cells (light gray box), and from rabbit preimmune sera (□) or with HMW-MAA-specific mAb 763.74 (▦). Cells were then washed with serum-free RPMI 1640 medium and incubated with either human PBMC (A and B) or human serum (C and D). After a 4-h incubation at 37°C, the radioactivity in the supernatant in each well was counted in a gamma counter. Results are expressed as mean ± SD. ∗, p < 0.05 vs all other groups. In contrast, no lysis was detected when M14#5/HMW-MAA cells were incubated with IgG isolated from rabbits sequentially immunized with peptide P763.74 and Colo38 melanoma cells in combination with normal human serum (Fig. 6⇑C). The lack of complement-mediated lysis occurred even though M14#5/HMW-MAA cells were sensitive to lysis using the GD3 ganglioside-specific mAb R24, a known complement-fixing mAb (Ref. 26 and data not shown). HMW-MAA+ MV3 melanoma cells were incubated with purified rabbit IgG and then seeded on type I collagen precoated cover slips for 1 h before fixation and fluorescence staining. Under these experimental conditions, cells did not firmly attach and/or spread extensively on the collagen surface, as indicated by the lack of cellular processes (Fig. 7⇓A). The extent of inhibition of cell spreading on collagen was similar to that in the presence of HMW-MAA-specific mAb 763.74 (Fig. 7⇓E). 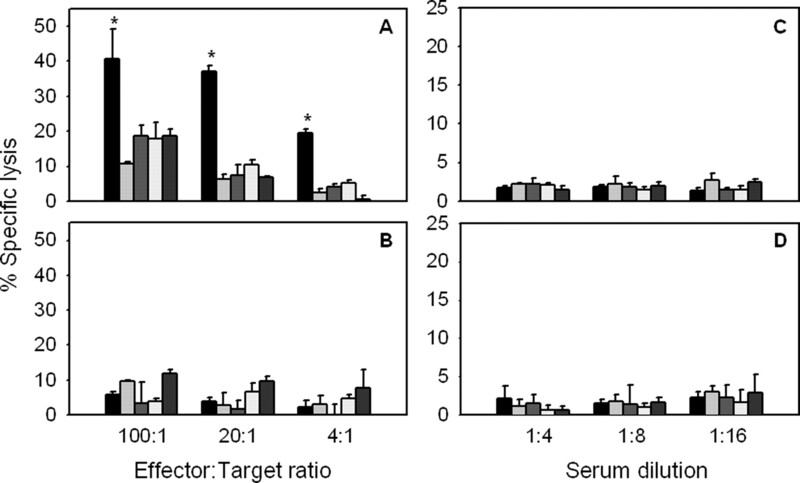 In contrast, no inhibition of cellular spreading was detected when cells were incubated under the same experimental conditions with IgG isolated from preimmune sera (Fig. 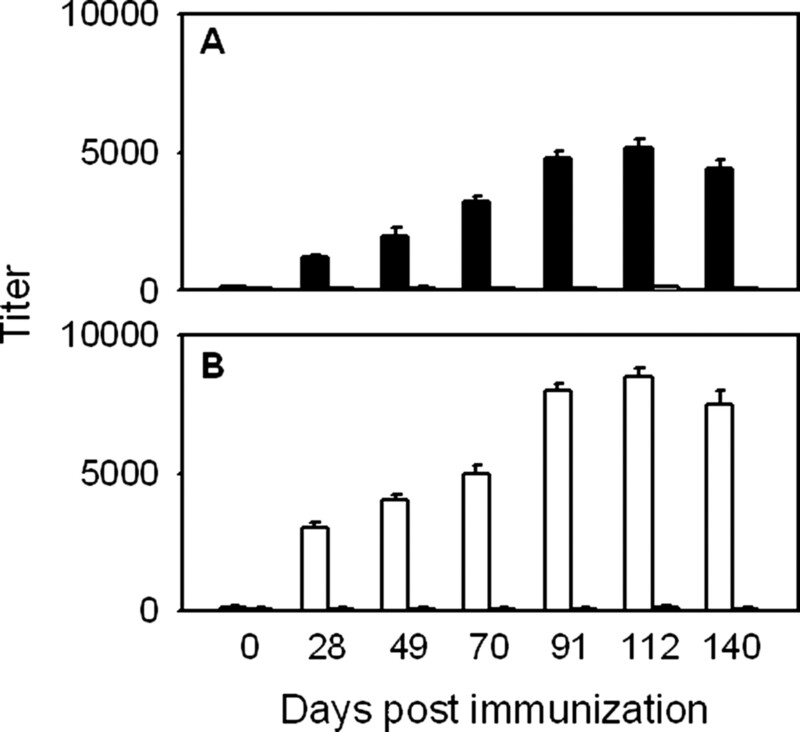 7⇓B) and from rabbits sequentially immunized with peptide P763.74 and LG2 cells (Fig. 7⇓C), or with the control peptide Delta225–239 and Colo38 cells (Fig. 7⇓D). Inhibition of HMW-MAA+ melanoma cell spreading on type I collagen by IgG isolated from rabbits sequentially immunized with peptide P763.74 and HMW-MAA+ melanoma cells. HMW-MAA+ MV3 melanoma cells were starved overnight. On the second day, cells were incubated for 1 h at 37°C with IgG (20 μg/ml) isolated from rabbits sequentially immunized with peptide P763.74 and Colo38 melanoma cells (A). Cells were then seeded on cover slips coated with type I collagen (2 μg/cm2). After incubation for 1 h at 37°C, cells were fixed, stained with rhodamine-phalloidin, and visualized under a fluorescence microscope. As controls, MV3 cells also were incubated under the same conditions with IgG (20 μg/ml) isolated from rabbit preimmune sera (B) and rabbits sequentially immunized with peptide P763.74 and LG2 cells (C), with control peptide Delta225–239 and Colo38 cells (D), or HMW-MAA-specific mAb 763.74 (E). Magnification, ×400. To determine whether HMW-MAA-specific Abs isolated from rabbits sequentially immunized with peptide P763.74 and Colo38 cells inhibit HMW-MAA-dependent melanoma cell migration, HMW-MAA+ MV3 melanoma cells were incubated with purified rabbit IgG and then seeded in the top chambers of a Transwell plate. Cells were stained after 8 h of incubation, and those on the bottom surface of the Transwells were enumerated. 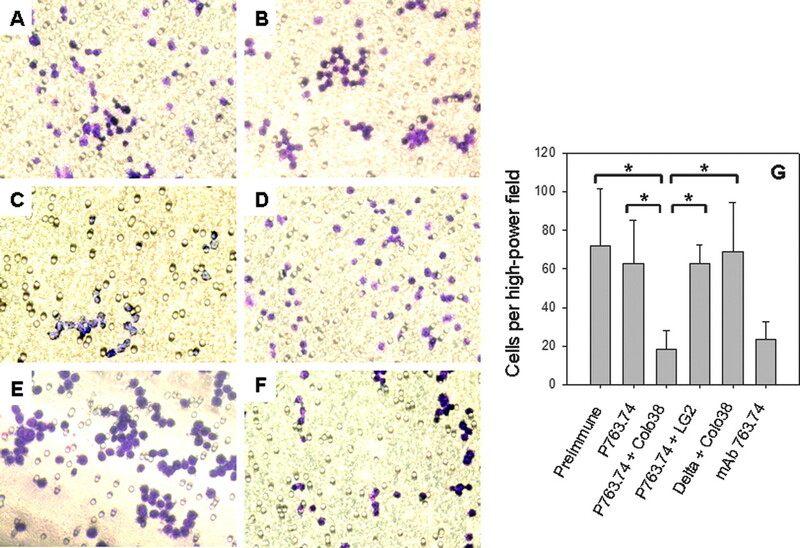 The migration of melanoma cells was significantly inhibited in the presence of IgG isolated from rabbits sequentially immunized with peptide P763.74 and Colo38 cells (p < 0.05 for all comparisons; Fig. 8⇓, C and G). This level of inhibition was similar to that achieved by incubating MV3 cells with the HMW-MAA-specific mAb 763.74 (Fig. 8⇓F). In contrast, no inhibition of cell migration was detected when the melanoma cells were incubated with IgG isolated from preimmune sera (Fig. 8⇓A) and from rabbits immunized with peptide P763.74 only (Fig. 8⇓B), with peptide P763.74 and LG2 cells (Fig. 8⇓D), or with control peptide Delta225–239 and Colo38 cells (Fig. 8⇓E). Inhibition of HMW-MAA+ melanoma cell migration by IgG isolated from rabbits sequentially immunized with peptide P763.74 and HMW-MAA+ melanoma cells. HMW-MAA+ MV3 melanoma cells were starved overnight. On the second day, cells were incubated for 40 min at 37°C with IgG (20 μg/ml) isolated from rabbits sequentially immunized with peptide P763.74 and Colo38 cells (C). Cells were then seeded in the upper chambers of a 24-well Transwell apparatus, which were precoated with fibronectin on the bottom surfaces of the Transwell membranes. The lower chambers of the Transwell were filled with 600 μl of culture medium containing 5 μg/ml fibronectin as an adhesive substrate. The Transwells were incubated at 37°C for 8 h, after which they were removed and stained with the HEMA 3 stain set solution. Cells on the top of the Transwells were scraped off with a cotton swab, and the remaining cells were enumerated under a light microscope. As controls, MV3 cells also were incubated under the same conditions with IgG (20 μg/ml) isolated from rabbit preimmune sera (A) and rabbits immunized with peptide P763.74 only (B), with peptide P763.74 and LG2 cells (D), with control peptide Delta225–239 and Colo38 cells (E), or with HMW-MAA-specific mAb 763.74 (F). A–F, magnification, ×200. The numbers of migrated MV3 cells under each incubation condition were enumerated by two investigators in a blinded fashion, based on four randomly chosen high-power fields. The results are expressed as mean ± SD (G). ∗, p < 0.05. To assess the ability of HMW-MAA-specific Abs to inhibit the invasion of melanoma cells through a layer of basement membrane matrix, MV3 cells were incubated with IgG isolated from rabbits sequentially immunized with peptide P763.74 and Colo38 cells. Cells were then seeded in the top chambers of Transwell plates that had been precoated with a layer of Matrigel. Cells were stained after 20 h of incubation, and those on the bottom surface of the Transwells were enumerated. In the presence of purified rabbit IgG, the ability of MV3 cells to invade through the Matrigel layer was significantly inhibited (p < 0.05 for all comparisons; Fig. 9⇓, C and G). The level of inhibition of HMW-MAA-dependent basement membrane invasion by melanoma cells was similar to that achieved in the presence of the HMW-MAA-specific mAb 763.74 (Fig. 9⇓F). In contrast, no significant inhibition of cell invasion was detected when MV3 cells were incubated with IgG isolated from preimmune sera (Fig. 9⇓A) and from rabbits immunized with peptide P763.74 only (Fig. 9⇓B), with peptide P763.74 and LG2 cells (Fig. 9⇓D), or with control peptide Delta225–239 and Colo38 cells (Fig. 9⇓E). Inhibition of HMW-MAA+ melanoma cell Matrigel invasion by IgG isolated from rabbits sequentially immunized with peptide P763.74 and HMW-MAA+ melanoma cells. HMW-MAA+ MV3 melanoma cells were starved overnight. On the second day, cells were incubated for 40 min at 37°C with IgG (20 μg/ml) isolated from rabbits sequentially immunized with peptide P763.74 and Colo38 cells (C). Cells were then seeded in the upper chambers of a 24-well Transwell apparatus, which were precoated with Matrigel. The lower chambers of the Transwell were filled with 600 μl of culture medium containing 5 μg/ml fibronectin as an adhesive substrate. The Transwells were incubated at 37°C for 20 h, after which they were stained with the HEMA 3 stain set solution. Cells on the top of the Transwells were scraped off with a cotton swab, and the remaining cells were observed under a light microscope. As controls, MV3 cells also were incubated under the same conditions with IgG (20 μg/ml) isolated from rabbit preimmune sera (A) and rabbits immunized with peptide P763.74 only (B), with peptide P763.74 and LG2 cells (D), with control peptide Delta225–239 and Colo38 cells (E), or with HMW-MAA-specific mAb 763.74 (F). A–F, magnification, ×200. The numbers of MV3 melanoma cells that invaded through the Matrigel layer under each incubation condition were enumerated by two investigators in a blinded fashion, based on four randomly chosen high-power fields. The results are expressed as mean ± SD (G). ∗, p < 0.05. In this study, we have demonstrated that Abs elicited in rabbits by sequential immunization with HMW-MAA peptide mimic P763.74 and HMW-MAA+ melanoma cells were able to 1) bind selectively to HMW-MAA+ cells and 2) immunoprecipitate HMW-MAA components from radiolabeled HMW-MAA+ cell lysate. Upon binding to HMW-MAA+ melanoma cells, the elicited Abs mediated ADCC and inhibited several HMW-MAA-dependent cellular functions, including spreading, migration, and Matrigel invasion. Consistent with our previous findings in mice (10), peptide P763.74 elicited two major Ab populations in rabbits: one subset reacts with only the immunizing peptide, and the other one reacts with the immunizing peptide and cross-reacts with HMW-MAA. The generation of a significant population of HMW-MAA-specific Abs could be achieved only after boosting with HMW-MAA+ melanoma cells in rabbits that were primed with peptide P763.74. These findings parallel the results obtained by other investigators using TAA mimics in several carbohydrate TAA systems (27, 28, 29). They are likely to reflect the affinity maturation and/or expansion of an existing Ab population of HMW-MAA-specific Abs that results from our prime-boost strategy. Therefore, both immunization components are required for the generation of an effective HMW-MAA-specific Ab response. We have previously established that peptide P763.74, isolated by panning a phage display peptide library with mAb 763.74, and anti-id mAb MK2-23, elicited with mAb 763.74, each mimic the HMW-MAA epitope recognized by HMW-MAA-specific mAb 763.74 (10, 13). Several lines of evidence suggest that peptide P763.74 and mAb MK2-23 are likely to mimic the same or overlapping region(s) of the HMW-MAA epitope defined by mAb 763.74 and to bind to the same or spatially overlapping region(s) of the mAb 763.74 Ag-combining site. First, peptide P763.74 inhibited the binding of mAb 763.74 to mAb MK2-23 (data not shown). Second, as with the Ab responses elicited by anti-Id mAb MK2-23 (30), Abs elicited in rabbits by our prime-boost strategy inhibited the ability of HMW-MAA-specific mAb 763.74 to bind to HMW-MAA+ cells. Lastly, both Ab populations, or at least part of them, express the Id recognized by anti-Id mAb MK2–23 in their Ag binding site (30), suggesting that the two immunogens stimulate the same or similar Ab-producing clones. IgG isolated from rabbits sequentially immunized with peptide P763.74 and Colo38 melanoma cells effectively mediated the lysis of HMW-MAA+ melanoma cells in an ADCC assay. This finding is consistent with the findings by Wagner et al. (23) that HMW-MAA-specific Abs elicited in rabbits by a peptide mimic of the epitope recognized by HMW-MAA-specific mAb 225.28S mediated a low level of ADCC of melanoma cells. However, in our study, the rabbit IgG did not mediate CDC of HMW-MAA+ melanoma cells, despite the fact that 1) the target M14 melanoma cells are sensitive to CDC (31), 2) human complement is efficiently activated by rabbit IgG (32, 33), and 3) the same human serum mediated CDC of the same melanoma cells using the GD3 ganglioside-specific mAb R24, a known complement-fixing mAb (Ref. 26 and data not shown). The lack of CDC mediated by IgG from sera of rabbits sequentially immunized with peptide P763.74 and HMW-MAA+ melanoma cells resembles the properties of HMW-MAA-specific mAb that we have tested previously (12). In addition, these findings parallel the observations of Ragupathi et al. (22), who noted that Abs recognizing either carbohydrate or peptide epitopes of mucin molecules were not effective in mediating CDC of target cells due to the large and relatively rigid biochemical structure of mucins. Although HMW-MAA is not considered a mucin, it is likely that the large (>250 kDa) and highly glycosylated nature of HMW-MAA may impose similar constraints on the ability of Abs to mediate CDC of HMW-MAA+ target cells. We also have demonstrated in the present study that, in addition to mediating immunological functions, IgG isolated from rabbits sequentially immunized with peptide P763.74 and Colo38 melanoma cells inhibited several HMW-MAA-dependent cellular functions, including spreading, migration, and Matrigel invasion. HMW-MAA and NG2, the rat ortholog of HMW-MAA, have been recently demonstrated to play important roles in intracellular signal cascades important for cellular adhesion, spreading, and invasion (2, 3, 5). In addition, some HMW-MAA-specific mAbs have been demonstrated to interfere with the signal transduction networks triggered by interactions between HMW-MAA and the ECM. The HMW-MAA-specific Abs generated in rabbits by our immunization strategy mediated the blockade of HMW-MAA-dependent cellular functions. It is likely that this inhibitory effect is caused by interference of the interaction between HMW-MAA and ECM components as a result of binding by HMW-MAA-specific Abs. Because the polyclonal Ab population elicited by peptide P763.74 is directed to the HMW-MAA epitope defined by mAb 763.74, our findings suggest that the portion of HMW-MAA that includes this epitope is important for the interaction of HMW-MAA with ECM components and for HMW-MAA-mediated melanoma cell functions. Consistent with this possibility, we have shown that mAb 763.74 can inhibit the same panel of HMW-MAA-dependent cellular functions. These findings are corroborated by the observations that some of the in vitro biological features of mimotope-induced Abs are similar to those of the mAbs used to isolate the mimotope (34). Although a direct comparison cannot be made between the effects mediated by murine mAb 763.74 and the rabbit polyclonal IgG elicited by immunization, the polyclonal Ab response appears to have the advantage that it can potentially recruit multiple effector mechanisms. In contrast, HMW-MAA-specific mAbs appear to be ineffective in recruiting immunological effector mechanisms but may still inhibit HMW-MAA-mediated cellular functions. We have not determined whether the same or different subsets of rabbit IgG are responsible for the immunological and nonimmunological effects on HMW-MAA-bearing target cells. However, it may be possible that there are subsets of rabbit IgG that recruit 1) predominantly immunological effector functions; 2) both immunological and nonimmunological effector functions; or 3) predominantly nonimmunological effector functions. Our findings support the possibility that HMW-MAA-specific Abs elicited by immunization with HMW-MAA mimics may act in vivo by blocking the ability of HMW-MAA to interact with collagen and other ECM components. Functional inhibition may occur in addition to the recruitment of FcR-bearing cells and/or complement to HMW-MAA+ melanoma cells. If our interpretation is correct, several mechanisms can account for the association between survival prolongation and development of HMW-MAA-specific Abs in melanoma patients immunized with HMW-MAA mimics. We thank Chun-Yen Tsao for critical comments during the preparation of this manuscript, and Hua Xu, Jacquelyn O’Mara and Drew Cameron for excellent technical assistance. 1 This study was supported by Public Health Service Grants P01 CA89480 and R01 CA105500 awarded by the National Cancer Institute, Department of Health and Humas Services, and by a grant from the Harry J. Lloyd Charitable Trust. ↵3 Abbreviations used in this paper: HMW-MAA, high molecular weight-melanoma associated Ag; ADCC, antibody-dependent cell-mediated cytotoxicity; CDC, complement-dependent cytotoxicity; ECM, extracellular matrix; KLH, keyhole limpet hemocyanin; TAA, tumor-associated Ag; i.d., intradermally; TMB, tetramethylbenzidine. Schwartz, N.. 2000. Biosynthesis and regulation of expression of proteoglycans. Front. Biosci. 5: D649-D655. Iida, J., A. M. Meijne, T. R. Oegema, Jr, T. A. Yednock, N. L. Kovach, L. T. Furcht, J. B. McCarthy. 1998. 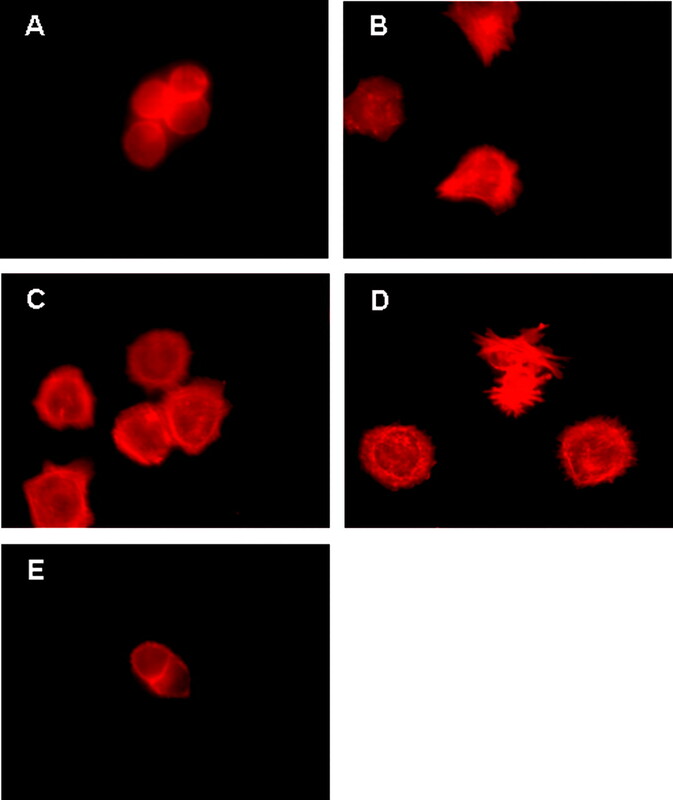 A role of chondroitin sulfate glycosaminoglycan binding site in α4β1 integrin-mediated melanoma cell adhesion. J. Biol. Chem. 273: 5955-5962. Eisenmann, K. M., J. B. McCarthy, M. A. Simpson, P. J. Keely, J. L. Guan, K. Tachibana, L. Lim, E. Manser, L. T. Furcht, J. Iida. 1999. Melanoma chondroitin sulphate proteoglycan regulates cell spreading through Cdc42, Ack-1 and p130cas. Nat. Cell Biol. 1: 507-513. Iida, J., D. Pei, T. Kang, M. A. Simpson, M. Herlyn, L. T. Furcht, J. B. McCarthy. 2001. Melanoma chondroitin sulfate proteoglycan regulates matrix metalloproteinase-dependent human melanoma invasion into type I collagen. J. Biol. Chem. 276: 18786-18794. Yang, J., M. A. Price, C. L. Neudauer, C. Wilson, S. Ferrone, H. Xia, J. Iida, M. A. Simpson, J. B. McCarthy. 2004. Melanoma chondroitin sulfate proteoglycan enhances FAK and ERK activation by distinct mechanisms. J. Cell Biol. 165: 881-891. Iida, J., A. M. Meijne, R. C. Spiro, E. Roos, L. T. Furcht, J. B. McCarthy. 1995. Spreading and focal contact formation of human melanoma cells in response to the stimulation of both melanoma-associated proteoglycan (NG2) and α4β1 integrin. Cancer Res. 55: 2177-2185. Fang, X., M. A. Burg, D. Barritt, K. Dahlin-Huppe, A. Nishiyama, W. B. Stallcup. 1999. Cytoskeletal reorganization induced by engagement of the NG2 proteoglycan leads to cell spreading and migration. Mol. Biol. Cell 10: 3373-3387. Mittelman, A., Z. J. Chen, H. Yang, G. Y. Wong, S. Ferrone. 1992. Human high molecular weight melanoma-associated antigen (HMW-MAA) mimicry by mouse anti-idiotypic monoclonal antibody MK2-23: induction of humoral anti-HMW-MAA immunity and prolongation of survival in patients with stage IV melanoma. Proc. Natl. Acad. Sci. USA 89: 466-470. Hafner, C., H. Breiteneder, S. Ferrone, C. Thallinger, S. Wagner, W. M. Schmidt, J. Jasinska, M. Kundi, K. Wolff, C. C. Zielinski, et al 2005. Suppression of human melanoma tumor growth in SCID mice by a human high molecular weight-melanoma associated antigen (HMW-MAA) specific monoclonal antibody. Int. J. Cancer 114: 426-432. Luo, W., J. C. Hsu, C. Y. Tsao, E. Ko, X. Wang, S. Ferrone. 2005. Differential immunogenicity of two peptides isolated by high molecular weight-melanoma-associated antigen-specific monoclonal antibodies with different affinities. J. Immunol. 174: 7104-7110. Schlingemann, R. O., F. J. Rietveld, R. M. de Waal, S. Ferrone, D. J. Ruiter. 1990. Expression of the high molecular weight melanoma-associated antigen by pericytes during angiogenesis in tumors and in healing wounds. Am. J. Pathol. 136: 1393-1405. Giacomini, P., A. K. Ng, R. R. Kantor, P. G. Natali, S. Ferrone. 1983. Double determinant immunoassay to measure a human high-molecular-weight melanoma-associated antigen. Cancer Res. 43: 3586-3590. Kusama, M., T. Kageshita, Z. J. Chen, S. Ferrone. 1989. Characterization of syngeneic antiidiotypic monoclonal antibodies to murine anti-human high molecular weight melanoma-associated antigen monoclonal antibodies. J. Immunol. 143: 3844-3852. Rosenberg, C. D., S. Ferrone, C. V. Hamby, V. Mancino, L. H. Graf, Jr. 1990. Interspecific DNA-mediated transfer and amplification of a gene specifying a Mr 100,000 human melanoma-associated cell surface glycoprotein. Cancer Res. 50: 1559-1565. Armandola, E. A., S. M. Mariani, S. Ferrone. 1993. Serological and molecular characterization of mouse anti-idiotypic monoclonal antibodies elicited with the syngeneic anti-HLA-A2, 28 monoclonal antibody CR11-351. Mol. Immunol. 30: 287-300. Desai, S. A., X. Wang, E. J. Noronha, Q. Zhou, V. Rebmann, H. Grosse-Wilde, F. J. Moy, R. Powers, S. Ferrone. 2000. Structural relatedness of distinct determinants recognized by monoclonal antibody TP25.99 on β2-microglobulin-associated and β2-microglobulin-free HLA class I heavy chains. J. Immunol. 165: 3275-3283. Temponi, M., T. Kageshita, F. Perosa, R. Ono, H. Okada, S. Ferrone. 1989. Purification of murine IgG monoclonal antibodies by precipitation with caprylic acid: comparison with other methods of purification. Hybridoma. 8: 85-95. Matsui, M., M. Temponi, S. Ferrone. 1987. Characterization of a monoclonal antibody-defined human melanoma-associated antigen susceptible to induction by immune interferon. J. Immunol. 139: 2088-2095. Holmes, K., B. J. Fowlkes, I. Schmid, J. V. Giorgi. 2002. Immunofluorescence staining of single-cell suspensions for detection of surface antigens. J. E. Couligan, Jr, and A. M. Kruisbeek, Jr, and D. H. Margulies, Jr, and E. M. Shevach, Jr, and W. Strober, Jr, eds. Current Protocols in Immunology 5.3.1-5.3.3. Wiley, New York. Zweig, S. E., E. M. Shevach. 1983. 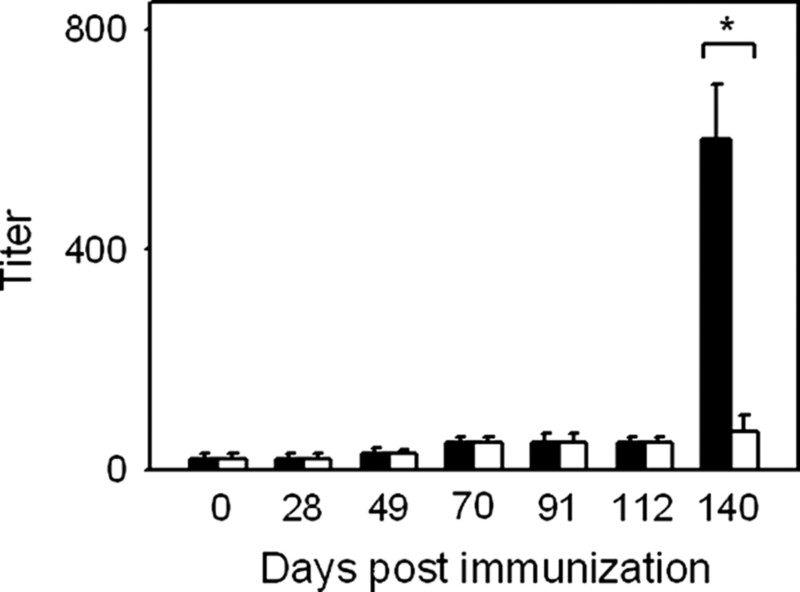 Production and properties of monoclonal antibodies to guinea pig Ia antigens. Methods Enzymol. 92: 66-85. Ragupathi, G., N. X. Liu, C. Musselli, S. Powell, K. Lloyd, P. O. Livingston. 2005. Antibodies against tumor cell glycolipids and proteins, but not mucins, mediate complement-dependent cytotoxicity. J. Immunol. 174: 5706-5712. Wagner, S., C. Hafner, D. Allwardt, J. Jasinska, S. Ferrone, C. C. Zielinski, O. Scheiner, U. Wiedermann, H. Pehamberger, H. Breiteneder. 2005. Vaccination with a human high molecular weight melanoma-associated antigen mimotope induces a humoral response inhibiting melanoma cell growth in vitro. J. Immunol. 174: 976-982. Deryugina, E. I., M. A. Bourdon. 1996. Tenascin mediates human glioma cell migration and modulates cell migration on fibronectin. J. Cell Sci. 109: 643-652. Knutson, J. R., J. Iida, G. B. Fields, J. B. McCarthy. 1996. CD44/chondroitin sulfate proteoglycan and α 2 β 1 integrin mediate human melanoma cell migration on type IV collagen and invasion of basement membranes. Mol. Biol. Cell 7: 383-396. Welt, S., E. A. Carswell, C. W. Vogel, H. F. Oettgen, L. J. Old. 1987. Immune and nonimmune effector functions of IgG3 mouse monoclonal antibody R24 detecting the disialoganglioside GD3 on the surface of melanoma cells. Clin. Immunol. Immunopathol. 45: 214-229. Cunto-Amesty, G., P. Luo, B. Monzavi-Karbassi, A. Lees, J. Alexander, M. F. del Guercio, M. H. Nahm, C. Artaud, J. Stanley, T. Kieber-Emmons. 2003. Peptide mimotopes as prototypic templates of broad-spectrum surrogates of carbohydrate antigens. Cell. Mol. Biol. 49: 245-254. Chapman, P. B., D. Wu, G. Ragupathi, S. Lu, L. Williams, W. J. Hwu, D. Johnson, P. O. Livingston. 2004. Sequential immunization of melanoma patients with GD3 ganglioside vaccine and anti-idiotypic monoclonal antibody that mimics GD3 ganglioside. Clin. Cancer Res. 10: 4717-4723. Chen, Z. J., H. Yang, C. C. Liu, S. Hirai, S. Ferrone. 1993. Modulation by adjuvants and carriers of the immunogenicity in xenogeneic hosts of mouse anti-idiotypic monoclonal antibody MK2-23, an internal image of human high molecular weight-melanoma associated antigen. Cancer Res. 53: 112-119. Hsueh, E. C., E. Famatiga, R. K. Gupta, K. Qi, D. L. Morton. 1998. Enhancement of complement-dependent cytotoxicity by polyvalent melanoma cell vaccine (CancerVax): correlation with survival. Ann. Surg. Oncol. 5: 595-602. Fujita, T.. 1979. The activation mechanism of human complement system by immune precipitate formed with rabbit IgG antibody. Microbiol. Immunol. 23: 1023-1031. Brown, P. B., F. A. Nardella, M. Mannik. 1982. Human complement activation by self-associated IgG rheumatoid factors. Arthritis Rheum. 25: 1101-1107. Riemer, A. B., H. Kurz, M. Klinger, O. Scheiner, C. C. Zielinski, E. Jensen-Jarolim. 2005. Vaccination with cetuximab mimotopes and biological properties of induced anti-epidermal growth factor receptor antibodies. J. Natl. Cancer Inst. 97: 1663-1670.